This is my column from the May edition of the Tennessee Bar Journal and is reprinted with permission of the Tennessee Bar Association. I’m the proud product of a typical middle class American family. I grew up in a part of Memphis called Frayser. In the 1950s and 60s, it was your prototypical blue collar community, anchored by four factories – International Harvester, Firestone, Humko, and Dupont. Adjacent to these factories were tiny little homes, and inside the homes were families. The Haltom family lived at 3102 St. Charles Drive. Our “mansion” was 1,200 square feet big, or make that 1,200 square feet small. Two bedrooms, one bath, a kitchen, and a combination living room and dining room. It was more than just a house. It was a home. It was warm in the winter, cool in the summer, and always full of love. And every night, my mother and father and I would gather at the dining room table for a family dinner. On Sundays after church, we would go to my grandmother’s house, just a few blocks away. 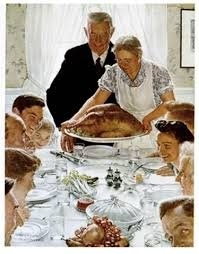 There we would enjoy a big family dinner with my grandmother, my parents, uncles, aunts, and about a million cousins. Family dinners were mandatory. With the exception of the nights I was away at scout camp in the summer, I can’t recall a single night of my childhood when I wasn’t a part of a family dinner. After 18 years of family dinners, I went off to college and began a new era of my life in which dinner was either in a cafeteria dining hall or a dorm room. For four years of college, and three years of law school, I pretty much lived on a diet of pepperoni pizza. That’s something my mother never served me for dinner. In the first few years of my law practice, I continued to survive on pizza, but for variety, I added to my diet massive quantities of bar-b-que. After all, I was back in my hometown of Memphis, the bar-b-que capital of the world. It is amazing I did not have a heart attack by the time I was thirty. And then in 1981, something happened that led me back to nightly family dinners. I played a small role in a wedding at the Holly Avenue Methodist Church in South Pittsburg, Tennessee. I was the groom. A few years after I said “I do” to Claudia, the good Lord sent me a son. And a couple years after that, he sent me another son. And then a few years after that, he sent me a princess! And suddenly, I was enjoying family dinners again with my wife and three children. It was in the words of the great philosopher Yogi Berra, déjà vu all over again. Family dinners weren’t always fun. They were particularly difficult when my boys were teenagers. They simply did not want to talk to their mother and me. And on the few occasions when they would say something, it would generally be rude. It reminded me of one of my favorite jokes. Question: Do you know why God asked Abraham to sacrifice Isaac when Isaac was 12? Answer: Because if God had waited another year, it wouldn’t have been a sacrifice! As a teenager, my son Ken was particularly adept at answering his parents’ questions at dinnertime by giving truthful responses but with a bare minimum of information. I once told Claudia that I was going to bring a video camera to our dinner table and tape Ken responding to my questions. I would then show the video to my clients in preparation for their depositions so that they could see how one truthfully responds to questions without really saying anything. By the time my princess became a teenager, she developed an annoying habit of texting on her IPhone while sitting at the dinner table. Her mother and I had to take the phone away from her which did not lead to sparkling dinner time conversation. But Claudia and I insisted that the kids join us for dinner each night and at least act like we were either Ward and June and Wally and the Beav or the Brady Bunch. Often we more closely resembled The Addams Family, but even on those occasions, we usually got through the family meal without a big fight. Not always, but usually. And then, before we knew it, the nest was empty. The children were grown and gone, and our big family dinners now occur on Thanksgiving and Christmas days. But my wife and I still have dinner together most every night. There may be only two of us at the table, but we’re still a family, just as we were when we were newlyweds. I confess that over the years I have taken my family dinners for granted. As a child, I assumed that every kid had a family and that every night that family gathered together for dinner. As a grown up, I too often failed to recognize how wonderful those dinners with my wife and children were. But now that my mother and father are in Heaven and my children have flown the nest, I realize that my family dinners over the years have been the best times of my life. I recently discovered something else about family dinners. As it turns out, family dinners may be a key ingredient to a successful life. In his new book, Our Kids, the Harvard social scientist Robert Putnam explores the consequences of the decline of American families. Putnam makes the compelling case that families are the bedrock of a successful, meaningful and happy life. And interestingly, Putnam emphasizes the importance of family meals, citing evidence that family dining promotes good grades and good behavior in our children. As it turns out, during all those family meals of my childhood, my parents were doing more than feeding my stomach. They were feeding my soul. And perhaps over the years, my wife and I did the same thing for our three children during nights at the family dinner table. No doubt about it, a family dinner is love in action. So here’s some advice for my fellow lawyers. If you are blessed to have a family, don’t stay late at the office. Go home and have dinner with your spouse and your children. If you’re in the middle of a trial or about to close on some big deal, put your file in your briefcase, take it home, and work on it after dinner. And while I’m preaching, let me add one more bit of nutritional and spiritual advice. Don’t have lunch at your desk by yourself. Unless you have a statute of limitations about to run, go out to lunch each day and break bread with your fellow lawyers and friends. Believe me, you’ll be happier, and also a much better lawyer. And now, if you’ll excuse me, I’m headed home for dinner. http://www.strikingly.com/: Most certainly, this unique gained everybody reasoning how many other training are actually acceptable for some of those sufferers what individuals see personally out of the office and / or need reasonably limited hardware methods. Peggy McClure: This by FAR one of your "classics" for sure! Don and I look forward to "breaking bread" with you and Claudia soon!